Why buy Gears of War 3 DLC packs individually, when you can buy them all at once for less money? You'll be able to get a discount for Gears of War 3's DLC, as long as you're ok with paying for it all up front. 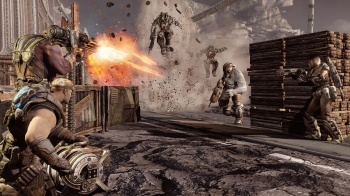 Epic and Microsoft have unveiled a new "season pass" for Gears 3, which will allow access to four DLC packs at a reduced cost. The pass will cost $30, or 2,400 Microsoft Points, which is supposedly a 33% saving on what it would cost to buy all four packs individually. It's not known at the moment what these packs will actually be; new multiplayer maps are the most likely candidates, as they have made up the bulk of Gears DLC in the past, but new gameplay modes are also possible, such as the "Annex" update for the original Gears of War. As an added incentive, anyone purchasing the season pass will also get an exclusive "liquid metal" weapon pack. While the details are all very vague at the moment, there's plenty of time for Microsoft and Epic to be more forthcoming, as the season pass won't be available until Gears 3 comes out in September. The first DLC pack will be available in November, with the remaining three coming out at unspecified dates after that. Out of all the different schemes and systems that developers and publishers are using to monetize DLC properly, this is probably one of the best ideas. Microsoft and Epic get make money on all four packs, and the consumer gets a discount and a neat little downloadable exclusive. Basically, everybody wins.